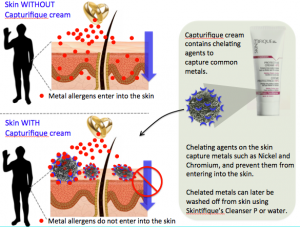 Skintifique has developed a unique, safe and efficient approach to protect skin from Nickel and other common metals. This approach, or technology platform, is designated by Capturifique. Ingredients are made to assemble in specific structures, which capture common irritants and allergens such as Nickel, through a mechanism called “chelation”. They also stay on the surface of the skin. Metals that come in contact with the skin are hence chelated by the structures and prevented from entering or re-entering it. They are later washed away while cleansing hands, showering, or removing makeup. Which products benefit from the Capturifique technology? At present, the Protective Cream HPS is the main product that benefits from this approach, and it is the product that is recommended for use when people know that they are going to be exposed to Nickel and other metals. The Moisturizing Lotion HP benefits to a lesser degree from this technology, and it is recommended for general preservation of skin. To receive more information about Capturifique, contact us directly.